This weekend, historians from across the country will gather in Calgary for the annual meeting of the Canadian Historical Association (CHA). It’s one of the few opportunities for Canadian historians and historians of Canada to connect in person, share their most recent research, and discuss larger issues facing the profession. Many attendees also take advantage of the chance to learn firsthand about the history of an unfamiliar city or region and its communities. Since 2013, we’ve been using a couple of metrics – mainly word counts and chronological markers in paper and panel titles – to provide an overview of what attendees are working on and talking about. 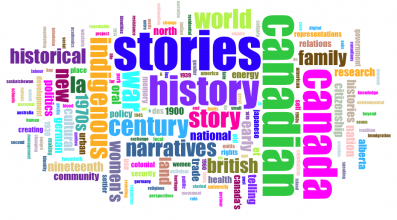 There’s nothing particularly rigorous about our methods, but previous posts (2013, 2014, 2015) have provided a starting point for discussions about what Canadian history looks like today, and how that profile has changed over time. As always, this year’s line-up speaks to the breadth and creativity of historical work being done in Canada. Over three days, 131 panels cover topics ranging from the fur trade to urban design, the suffrage movement to colonial roads. A couple of things are immediately obvious from this visualization. First, delegates took the conference theme of “stories” seriously. In 2016, the words “stories,” “story,” and “narrative” trump all other words used in paper titles. There is a strong emphasis in the program on community-engaged storytelling: more than a dozen papers over several panels explicitly focus on oral history research and methodology. Second, much like previous years, “Indigenous” and “war” continue to be on the top of the list of themes. There is however, considerable difference in the words that follow. After noting a general decline in the word “women” last year, it appears more prominently in paper titles this year; though it follows “world,” it precedes, “British,” “family,” “1970s” and “land” as the words most frequently mentioned in paper titles. Similarly, the overall word count has shifted dramatically from last year’s emphasis on subjects related to development, politics, international and the state. Looking over the past three annual meetings, this year the term ‘politics’ falls much further down the list, where it had been among the top ten words most frequently used, and ‘Ontario’, which was in the top ten in 2013 and 2014, appears only three times this year. Hardly surprising, the most prominent province in this year’s program is Alberta. This observation is partially confirmed when we look at the Canadian regions mentioned in paper titles. Whereas in previous years Quebec and Ontario were the most prominent subject provinces, this year the Prairies are over-represented. Interestingly, in comparison with last year, the overall percentage of papers focused on British Columbia and Ontario has remained more or less the same. Meanwhile, interest in the North has increased, while both in Quebec and Atlantic Canada declined. The drop in interest in Quebec may partially reflect the general drop in French-language presentations when the CHA is held in Western Canada. Much like during the 2013 annual meeting, when the CHA was held in Victoria and there were just six French-titled papers, there are only 13 French titles this year (compared to 37 on last year’s program). Much like last year, internationally- and transnationally-focused papers tend to be better represented than they were in 2013. 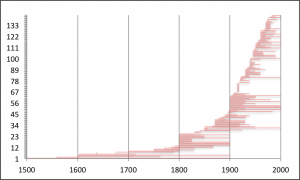 Looking by time period, we can see that the popularity of the (relatively) recent past remains strong, a trend observed in all of the past analyses and something Robert Englebert wrote about on the site in 2015. Of the 142 papers whose time period could be easily determined from the title, more than half address the twentieth century. In contrast, around a quarter of papers (24%) cover the nineteenth century, and only 9% cover the period up to 1800. To use a different milestone: explicitly pre-Confederation topics account for 23% of papers. Turning now to the annual meeting itself, there are a number of special events that will be of interest to followers of this blog. Bright and early at 8:30 am on Monday May 30th, we’re co-sponsoring with the Network in Canadian History and Environment (NiCHE) a discussion about history blogging in Canada, featuring historians working on The Otter/La Loutre, Borealia, Acadiensis, Findings/Trouvailles, and our very own Beth Robertson. This is the first of two events Active History is directly involved in organizing. The second is the annual meeting of the Active History group within the CHA, also taking place on Monday, at noon in SA-13 (note that this room is different than what appears in the preliminary program). In the past this informal meeting has taken different forms, but it has always meant a group of like-minded historians gathering together to chat about the last year in the project’s history, and what the new one holds in store. We’d encourage anyone interested in hearing more about the project or getting involved, whether by writing for the blog or through other collaborations, to stop in and say hello. If you’re in Calgary but busy Monday at noon, feel free to stop Beth Robertson, Jim Clifford, Tom Peace, or Daniel Ross in the halls to chat about anything related to the blog and the larger Active History project. One of the most exciting aspects of the CHA meeting, from our angle, is the chance to meet face-to-face with contributors, readers, and friends of the project we see infrequently or know only as a byline or twitter handle. More broadly, the 2016 CHA program is full of talks, screenings, and tours that demonstrate just how active and community-engaged our profession can be. The annual meeting kicks off at 6:30 pm Sunday May 29th with a community event entitled “Is Oil a Dirty Word? Stories from the Humanities” at Theatre Junction Grand in downtown Calgary. Among those featured in what promises to be an exciting panel discussion is York University professor and regular contributor to ActiveHistory.ca Sean Kheraj. For some fascinating background on Canada’s long history of oil extraction, we highly recommend his longstanding series on pipeline spills (see in particular this 2013 piece and this one from 2015). Monday morning, University of Minnesota professor and noted scholar of Indigenous history Jean O’Brien will be delivering a keynote address entitled “Memory and Mobility: Grandma’s Mahnomen, White Earth.” At lunch on all three days, Kevin Allen, the lead researcher of Calgary’s Gay History Project, will be leading a 50-minute walking tour that will take participants through some of the key sites for queer activism, culture, and politics on the University of Calgary campus. In the evening of the first day there are two events of interest to our readers. 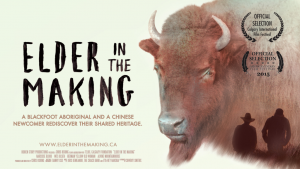 At the Plaza Theatre in central Calgary, there will be a screening of Elder in the Making, a film guided by filmakers Chris Hsiung and Cowboy Smithx (who will be in attendance) as they explore the historical contexts that have culminated in present-day realities in southern Alberta. Not far away, at the Glenbow Museum, Barbara Brookes will deliver the keynote address at the Canadian Committee on Women’s History reception entitled: “Subject to Citizenship: the British Crown, New Zealand Maori Land, Women’s Suffrage, and komiti wahine. The next day at lunch, in addition to Kevin Allen’s walking tour, the Aboriginal Studies Group has organized a tour of the Glenbow Museum (click here for tickets). 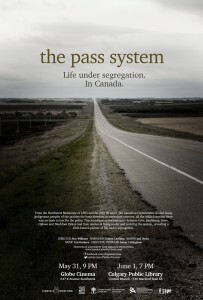 Beyond the official CHA program, there will also be two screenings of the well-reviewed documentary, The Pass System. The first will be held at the Globe Cinema on 31 May at 9 pm and the second the following day at 7 pm at the Calgary Public Library. The film features noted historians Sarah Carter, Winona Wheeler, Jim Miller, Brian Titley and John S. Milloy. Here we have combined “women’s” with “women” which are divided in the visualization. For a full ranking of words click here. Another great round-up and analysis of the CHA program. It occurred to me that your work would be made much easier (and enhanced), if the CHA required applicants to the annual meeting to include keywords or tags with their papers. I believe this is the case for other conferences. With these tags, you could more easily identify topics, time periods, and other info that can’t easily be drawn from the titles of the papers. There is a mobile app for the program this year and it even includes the room information! An online proposal submission system with tagging might not be too far around the corner. Thanks Sean! As Daniel and I were writing this post I had the same thought. Greater coordination with the organizing committee would definitely minimize a lot of the formatting work that goes into making the word cloud. It would also help even out some of the inconsistencies with using titles. If participants submitted regional and temporal information alongside keywords, we’d have a much more complete picture. Also, with access to submission files, the entire abstract for panels and papers could be used to generate the word cloud/word counts. I suspect that this would somewhat change the picture I described above. Interesting analysis as always. I was struck that the proportion of pre-Confederation papers has doubled from last year (24% as compared to 11%, with a concomitant decline in 20th century papers). Do you have any idea why this changed since it looks like a positive development for the field of Canadian History? A number of people pointed out that the Sunday evening event “Is Oil a Dirty Word?” is somewhat poorly represented in this post. We apologize for any misrepresentation above. The overall event was organized by Petra Dolata, a Canada Research Chair in the Department of History at the University of Calgary, and features a roundtable discussion moderated by journalist and author Chris Turner. The panel features Ellen Close, Petra Dolata, Terrance Houle, Sean Kheraj, Melanie Kloetzel, Dominique Perron and Imre Szeman. Here’s a better description of the event: Echoing the theme of the 2016 Canadian Historical Association’s annual conference, “Stories,” this community event takes a quote from Saskatchewan Premier Brad Wall as a starting point to discuss the many meanings of oil for people living in Calgary and Alberta. 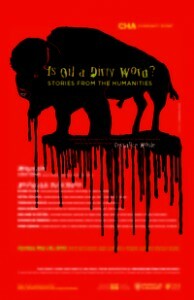 In July 2015 Wall insisted “oil is not a dirty word” nor a “four letter word.” Rather than agreeing with or contesting these contentions scholars and practitioners from the humanities will share oil stories – including those that run counter or are not heard – highlighting the many meanings of oil and take apart accepted understandings in order to engage the public in a more reflective and critical discussion of oil in today’s society, especially in Calgary.